Thames Catering & Events: Wedding celebrations. As you can imagine, we are involved in a number of weddings every year. However, this year we were on the other side of the fence, and between Christmas and New Year we were guests at the wedding of my sister C and her lovely new husband J. 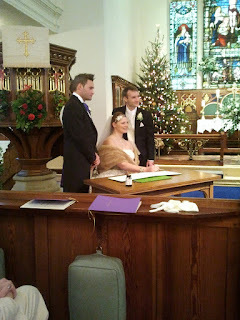 The church service was so lovely and personal to them. The vicar even shared a box of chocolates with us to illustrate his sermon. I had been asked to do a reading in the church, and as I am a fairly emotional character at times like that, I was really nervous. However, I'd practised the reading over and over till I thought I was immune. I had a hymn and a small part of the service to pull myself together, but as I walked forward I knew it would be touch and go! I was almost lost when I looked at C and she was also welling up, but I just about managed to hold it together, although the line 'you can cry on my shoulder' did raise a laugh! 'I Will Be Here' by Steven Curtis Chapman has to be one of the most perfect readings for a wedding, and I have C & J's permission to share it with you, along with a photo of their day. I hope it may provide inspiration for some of our future brides and grooms. It is a nice information share about the wedding celebrations. Useful Tips for the wedding planning. If any couples need a help, they may read this post. Today the tips and helps available like wedding planner person, mobile wedding app, friends, Many tips available like in this etc. It's the thing the couples has to implement the plan for their wedding.